East Yorkshire Motor Services (EYMS) coach trips magazine. Homepage. This page: A nicely illustrated East Yorkshire Motor Services staff magazine from the 1940's. 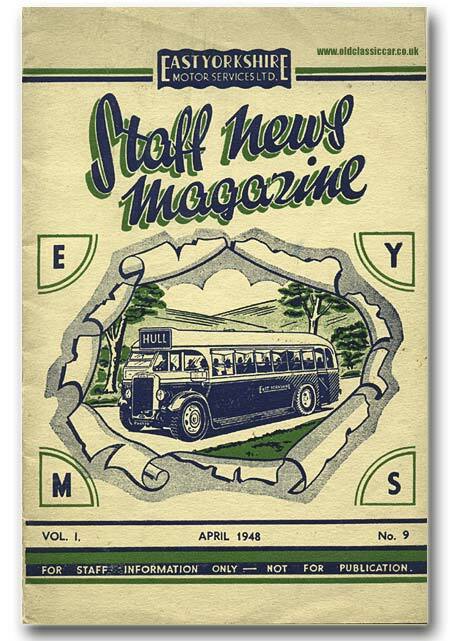 EYMS Staff News Magazine for April 1948. This isn't the first time that East Yorkshire Motor Services (EYMS) has appeared in this section of the site, as a pre-war EYMS sports & social club membership card was added in some time ago. This item though dates to the early post-war years of coach operation in the UK. This magazine, dated April 1948, was for the employees of EYMS. With motor fuel rationing still restricting the use of private cars, coach trips were a popular option for people who wanted a day trip out. In addition to operating scheduled coach services around the area, in 1948 EYMS resumed their pre-war "Land Cruise" service, albeit not with as many trips as were offered in 1939. The magazine, which runs to sixteen pages, contains staff news (births, marriages etc), raffle prize winners, and other items of interest to EYMS employees and their families. Updates to services are also included, to ensure that drivers and their conductors were fully up-to-speed with the latest routes and fares. "We have recently received complaints from the Keyingham Parish Council that children travelling on the buses from Withersnea are in the habit of hanging out of the bus, when approaching the main street in Keyingham. As conductors are aware, passengers, whether children or otherwise, are not permitted to travel on the platform of buses, and it is requested that this practice should be stopped forthwith." At a recent concert, a number of raffle prizes had been given out, and thanks were extended to all the donations that had made the raffle possible. These prizes included a hankerchief case, a 10/- note, five bottles of beer (hmmmmm), a propelling pencil, a fancy jam dish, and one pair of rabbits. Several of the older employees of the Company will remember the occasion when a certain driver went into a bus and said to the passengers in a loud voice, "Give me plenty of warning when you want me to stop, there are no brakes on this bus." More items of paperwork relating to motoring in the pre- and post-war years can be found in the Motoring Collectables section of this website.